An Ontario, Canada institution is drawing attention to its accessibility initiatives and resources. On Dec. 3, in celebration of the International Day of People with Disabilities, McMaster University will award its first accessibility award to honor accessibility efforts on campus. 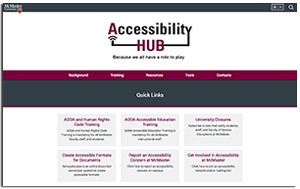 Shortly, it will also publish an accessibility and disability inclusion update to profile the work being done on campus. A seminar series focused on accessibility in teaching and learning. These are being delivered by the institution's MacPherson Institute, which provides faculty development, including seminars on teaching online and using active learning classrooms. "You can't learn, teach or research effectively if you're facing artificial or constructed barriers that prevent you from doing so," said McMaster President Patrick Deane, in a prepared statement. "Accessibility is a process and perspective, not a destination, and can be integrated into any teaching, research, or service activity that we participate in. It needs to be infused into our thinking from the outset rather than an afterthought."